The man, carrying a basket dripping with blood and slick with fresh entrails, was yelling. The sun had set, and in the empty dirt lot north of the old town of Harar, Ethiopia, where a dozen or so people had gathered, the only light came from yellowish headlamps of an old SUV. The man repeated a high-pitched shriek that lasted a good four or five seconds, something between a mournful wail and a yodel. After a minute of silence, we heard light, quick footsteps. I saw a sullen, hunched-over silhouette, then a pair of glowing eyes. Then two pairs. Hyenas. They were intimidating — bigger than I expected, with thick necks and huge jaws. And they were just one of the many compelling things I encountered during my continued exploration of Ethiopia. Having spent several days in the capital, Addis Ababa, I turned my attention to the cities of Lalibela, with its astounding group of rock-hewed churches dating to the reign of King Lalibela (around 1181 to 1221 A.D.), and Harar, east of Addis Ababa, the epicenter of Muslim culture in Ethiopia. These trips reinforced my opinion that Ethiopia is one of the more exciting places in the world to visit right now: an attractive mix of ancient tradition and rapid modernization. What’s more, it can all be seen fairly economically. Preparing for an Ethiopian adventure requires planning and a certain amount of patience — and, in my case, the use of a handy loophole to deal with the sky-high airfares some visitors to Africa face. Flying to Africa from the United States isn’t cheap, and flying within Africa isn’t much cheaper. Visitors to Ethiopia who enter the country on Ethiopian Airlines, however, can take advantage of vastly discounted flights within the country. My one-way ticket to Lalibela on Ethiopian set me back just 1,488 Ethiopian birr (a little over $50), roughly a third of what I would have paid had I entered the country on a different airline. (Retain your boarding pass to prove you entered the country on Ethiopian to receive the discount, or get the discount online.) Not only that, it saved me an arduous bus journey from Addis Ababa that would have taken an entire day, possibly longer given the rainy weather. 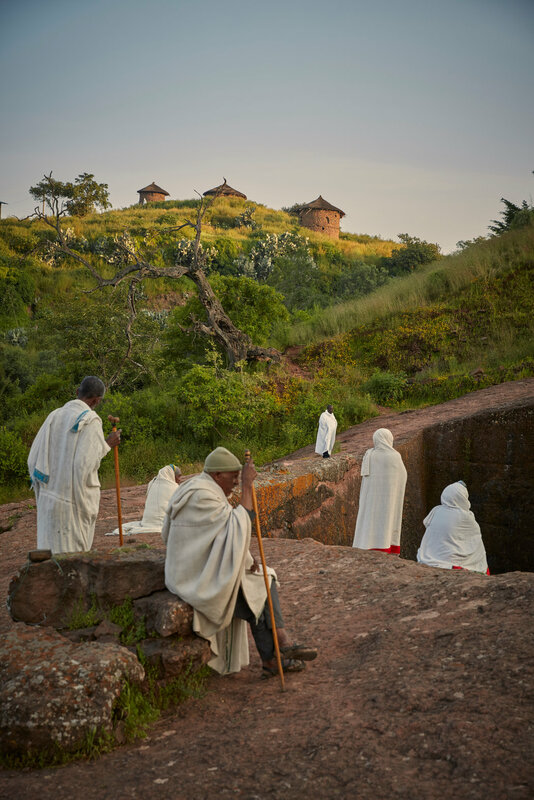 I usually eschew tours, but I found a deal from Ethio Travel Tours that was just too good to pass up: two nights in Lalibela, a tour guide for two days, entrance to the churches (1,164 birr, if you buy separately), and ground transportation — all for just $200. The lodging alone — two nights at the Mountain View Hotel, with breathtaking views of the Lasta Mountains — would have cost me $130 booked separately. I found the tour to be well worthwhile. Not having to use mental bandwidth fretting about transportation, especially when traveling alone, is invaluable. Was it all seamless? Not quite. After a gorgeous, winding drive from the airport, snaking through the Amhara region, the driver dropped me off and unloaded my bag in front of a shabby-looking hotel that was not the agreed-upon Mountain View Hotel. When I complained, he shrugged: “The hotel changed,” he said. I insisted and showed him my email from Ethio Tours — he relented and we continued on. Fortunately, I had a good tour guide. Mareg Asmro, an affable young man who aspires to study in China someday, educated me about the history of the city as we walked toward the first of the group of 11 monolithic churches cut directly into the earth — gigantic structures hewed from single blocks of rock. 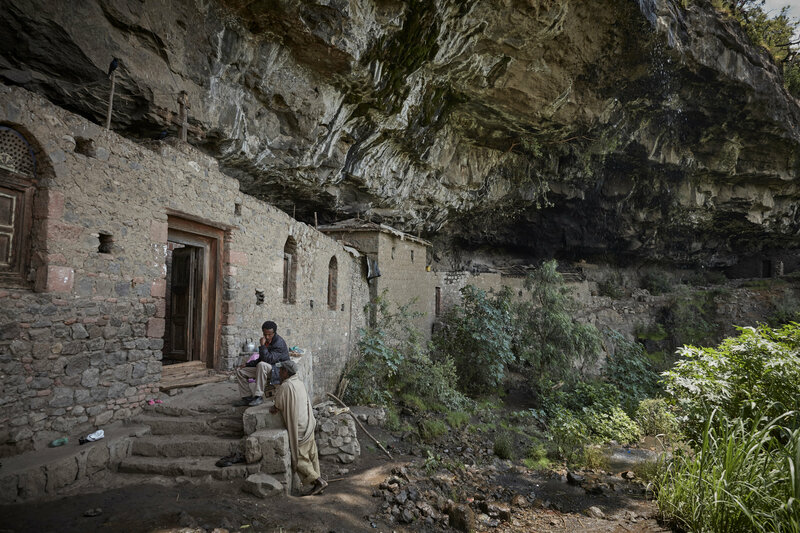 “Lalibela was both a priest and a king,” Mr. Asmro said. 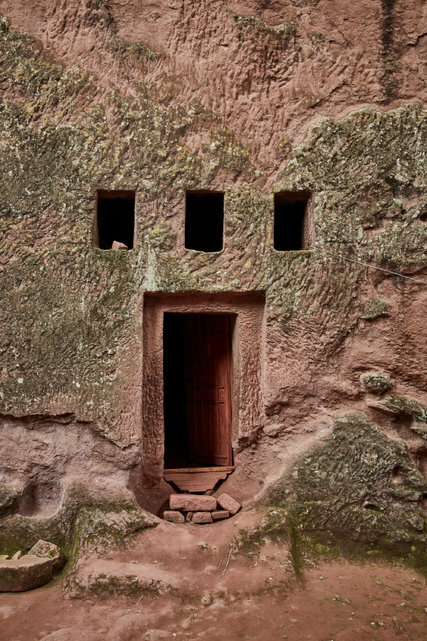 “King Lalibela wanted to construct these churches because Ethiopian Orthodox Christians wanted to make the pilgrimage to Jerusalem to see the birthplace of Jesus Christ.” But many were unable to make or perished during the journey. When King Lalibela saw that, he envisioned a New Jerusalem to which the faithful could make the pilgrimage. We spent the afternoon exploring the six churches in the first group. 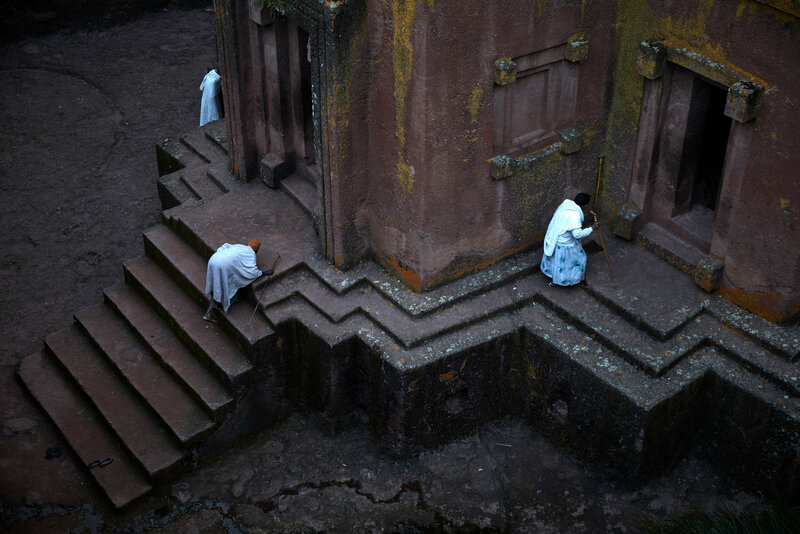 We began with Bete Medhane Alem (Savior of the World), considered to be the largest monolith church on earth. The reddish-brown structure is carved deep into the volcanic rock, with the roof following an imaginary line where the natural landscape would have crested. Everything is built from the same rock, including doors, windows and pillars. 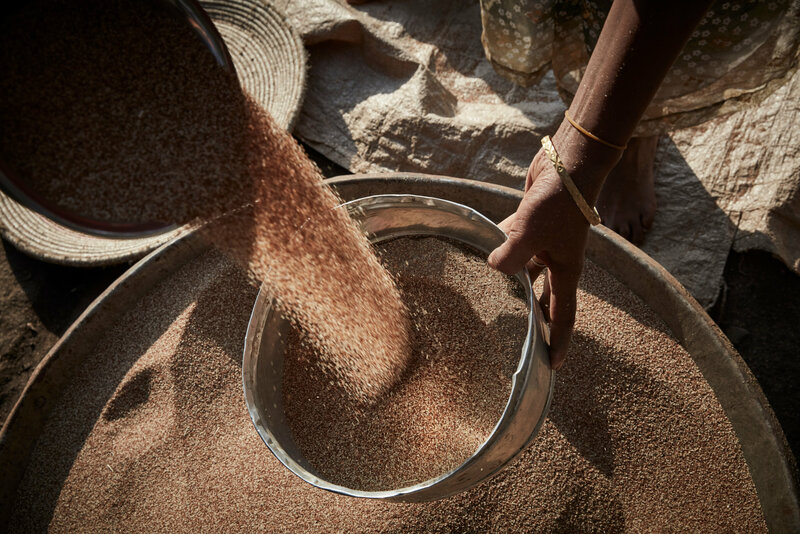 Within the cool, dusky interior, heavy carpets are thrown on hard ground for the services that take place. From there, we passed through various series of trenches and tunnels, going from one holy building to the next. Some were larger than others; each had a priest who would go from time to time behind a giant curtain hung within each church. “Behind that is the holiest of holies,” Mr. Asmro explained in a hushed tone — replicas of the ark of the covenant that only the priests were allowed to view. They were all impressive, but none quite as markedly so as the final church, Bete Giyorgis (Church of St. George), which is set slightly apart from the others. It’s this very separation that makes this church so dramatic: The church, which suddenly plunges dozens of feet below ground level has a tawny exterior mottled with green and yellow moss, and, from above, forms the shape of a cross. It can be entered like the others, and requires a downhill trek into what feels like the jaws of the earth to reach the front entrance. Our final stop, on the outskirts of Lalibela, was the Asheton Maryam Monastery, which we reached after a 20-minute car ride. The monastery, while not particularly active, was still beautiful, carved into the side of the hill and accessible via a narrow path. Before parting, I tipped Mr. Asmro 500 birr for the two days we were together — a little less than $20. While the churches are Lalibela’s biggest attraction, they weren’t its only appeal: I also had to eat. A lunch at the Seven Olives Hotel one afternoon proved to be tasty and economical: My meal of gomen tibs, sautéed vegetables served with a generous portion of sour, spongy injera bread, was delicious (55 birr). 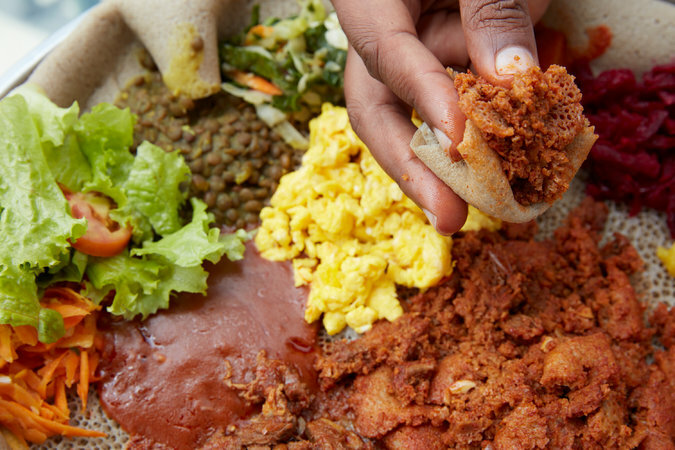 A less traditional but inventive fusion meal can be had at Ben Abeba, a restaurant off the main highway — a partnership between Habtamu Baye, an Ethiopian man, and Susan Aitchison, a Scottish woman. The physical structure of Ben Abeba resembles a hulking spaceship from an old television show — simultaneously futuristic and charmingly outdated. There are numerous levels and various ramps that made me feel like I was trapped in an Escher drawing. It’s a fun place, and fortunately, the food isn’t bad, either. I ordered a half portion of the shepherd’s pie (109 birr) and mixed it with some hot, slightly bitter berbere spice paste that was on the table. The classically Ethiopian flavor worked well with the heavy, savory pie. It was enough food to carry me through the next day. I had left Lalibela, transferred through Addis Ababa again and was now in Dire Dawa, the city with the closest airport to Harar. It would be a one- or two-hour drive to Harar — I just had to figure out how to get there. The hotel I was staying at offered an airport transfer for $50 each way, which seemed a bit steep. I headed instead to the bus station in Dire Dawa, and saved a decent bit of money by hiring a private car there (400 birr, less than $15). My Fanta-swilling driver pulled small, green leaves from a plastic bag next to him during the whole journey. He was eating khat (pronounced chaat), a small shrub endemic to the area, the consumption of which provides an amphetaminelike rush. He offered me a few choice, tender young leaves, which I tried: It was bitter, with a similar effect to the coca I had tried while traveling in Peru (like coca, it’s a controlled substance in the United States). “It’s a big problem,” said Lishan Ketema, a local man I hired as a guide once I had settled in Harar. (I found Mr. Ketema through my hotel, the Winta Hotel, where I paid 621 birr per night for a passable room). Walking around the old walled city, it certainly seemed like the majority of men were consuming the leaf. He also said the khat was hurting the country economically, as tracts of agricultural land, traditionally set aside for exports like coffee, was now dedicated to cultivating the addictive plant. We took a leisurely stroll through the narrow streets and along Harar’s beautifully colored walls. We toured the famous gates (there are five that served as original entry points to the city), visited a local Muslim family’s home and stopped by the Arthur Rimbaud Cultural Center, where the French poet once resided. As the sun set, I was getting antsy: It was almost time to go to the hyena feeding area. Mr. Ketema warned me that sometimes the hyenas show up and sometimes they don’t. We would just have to get lucky. We got lucky. But the hyena man, who seemed to know them by sight and be able to distinguish between their different personalities, didn’t trust the few hyenas that had shown up to allow visitors to feed them. So we waited, the hyena man periodically piercing the silence with his call. After an hour had passed, we were about ready to give up. Suddenly, more hyenas emerged from the darkness. The hyena man, reaching into his basket of glistening entrails, began feeding the animals, which would cautiously gobble a morsel before retreating back a few feet, emitting a whiny, whooping noise. Then the hyena man pointed at me, then pointed to the ground next to him. It was my turn. The bite of the hyena is one of the strongest of any animal on earth, so feeling the hot breath of one of these animals on my ear was disconcerting, to say the least. I did as the hyena man said: knelt down on the ground, not looking at or engaging the animal. He held a piece of meat right around my shoulder. The hyena approached cautiously then gobbled it down, about an inch from my ear. At the hyena man’s encouragement, I ran my hand through the animal’s coarse, bristly fur. It didn’t notice at first, and then, suddenly realizing it was being touched, yelped loudly and scurried away. Then it was my turn to feed. The hyena man handed me a piece of offal at the end of a short stick. I held it near my face as the hyena approached, head slunk down low. Then, all I could see was a thick pink tongue and sharp teeth as the hyena opened its jaws and devoured the meat about a foot from my nose. “O.K., finished,” the hyena man said, and I took my place back in the crowd. That was just fine with me. While this was an unforgettable experience to cap off my time in Ethiopia, I felt fortunate to still have a face.